Someday Extraordinary . 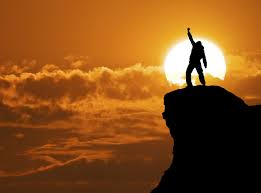 . .: Winning or Losing by Saving??? This thought has crossed my mind a number of times, especially after reading so many blogs on penny pinching. The argument against this is that it is a mindset. 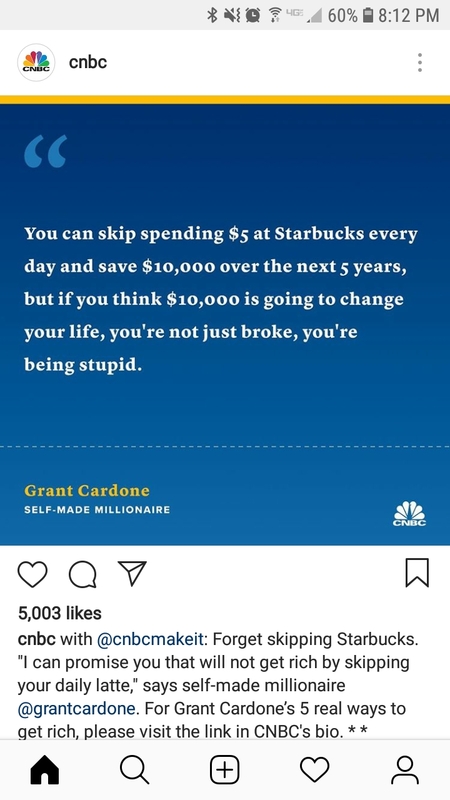 If you skip that $5 Starbucks every day, then you stop yourself from buying into that materialistic mindset - it's not just a cafe latte, it's a new Benz every 2 or 3 years. I get that. And you have to ask, "Where do you draw the line?" Maybe $10,000 won't make a huge difference in your life, but would an extra $50,000. At the core, this has to come down to why a person partakes in a certain action. I buy Starbucks because I thoroughly enjoy coffee. I don't buy it every day, but if I feel like a caramel macchiato, I honestly have more second thoughts about the calorie intake than I do about my pocketbook. A Tesla Model X? I think it's simply a status symbol. I don't think I gain $50k more comfort out of driving one than I do my Grand Cherokee. I think that is the difference. Warren Buffett buys himself a McDonald's breakfast for $3.17 or less every morning. While he is known to be frugal, he does so because it fits his lifestyle. He doesn't want more houses because he doesn't want more to maintain. That's how he lives. He could easily pare down his breakfast costs by purchasing Chex at the grocery store, but that's not what it's about. He was always more about capital growth via wise investments than saving a few extra bucks each year in hopes of retiring early. And that's where I think so many people, young and old, have it wrong. I honestly believe the mindset this day and age is backwards. With people living longer and the cost of health care being astronomical, I think saving your way to retirement is a ridiculous concept. And that's true whether you're looking to retire early or you're counting down the years until you finish working a job you've held for 45 years. The point is, you better have one or more additional streams of income. I wholeheartedly agree with Cardone. That $10,000 that you'd save over 5 years may be $80,000 over 40 years, but the argument remains. $80k isn't much over a working career. It's less than many make over the course of a year. 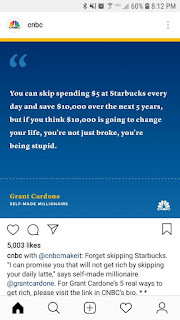 Forget skipping that Starbucks - just work one more year and you're break even or maybe a bit ahead! I think what Cardone is getting at by claiming those who abide by this rule are "stupid", is that you're looking at the world backwards. Spend your time looking for opportunities to grow your capital instead of clipping coupons. You'll come out WAY ahead!